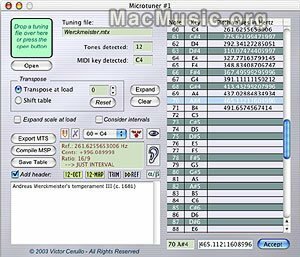 MaxMagic Microtuner is a microtonal editor made by Victor Cerullo for Max/Msp.This new version 1.4.4 is now fully compatible with Mac OS 10.3 Panther and adds a new "export Mac Coll" feature. This update is free for versions 1.4, 1.4.2 and 1.4.3 users. ExsManager is a dedicated management software for Exs24 instruments and files. This new version 2.5 adds support for Mac OS X and improves speed processing, typically from 30 to 50% faster. The ExsManager version 2.5 is a free update from 2.1: registered customers will automaticallly receive the update in the next few days. Exs Manager Post a comment ? Spectrasonics has released new updates of their virtual instrument plug-ins Trilogy, Stylus and Atmosphere. The updates add enhanced compatibility for Apple's powerful new Macintosh G5 and the latest OS X version 10.3, code named Panther. All Mac OSX plug-in platforms have been updated, including Steinberg VST, Digidesign RTAS and Apple's new Audio Units plug-in format. The updates also support the previous OS X version, Jaguar v10.2. 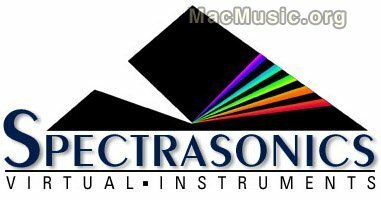 The plug-ins are available for registered owners as a free download from the Spectrasonics website. iTMS-Europe Petition Post a comment ? Universal Audio announces the availability on download of drivers for their UAD-1 Powered Plug-Ins DSP Card on Mac OS X. Updates for UAD-1 Powered Plug-Ins and UAD DreamVerb 3.3.1 are available on free download. UAD drivers Post a comment ?